Washington is full of chaos. Cable news outlets up and down the dial focus on infighting. Some call it a media and political “circus.” Bruce Poliquin stays focused on one thing: fighting for Maine. As our Congressman, Bruce is successfully fighting for Maine jobs, opposing unfair trade deals which harm Maine’s economy, standing up for our Veterans, working to lower taxes on Maine families and job creators, and protecting our Maine way of life. Born and raised in Central Maine, Bruce is committed to ensuring that Maine families can succeed and prosper with good paying jobs and a growing Maine economy. As the son of a teacher and nurse, Bruce was raised in a working class family where he learned about public service and the meaning of hard work. He learned firsthand about the importance of quality healthcare and a solid educational foundation from his mother and father. He earned scholarships and worked to attend college. He painted metal roofs, dug sewer lines, and worked the night shift at the Wyandotte Spinning Mill in Sidney. After college, Bruce found work in the city. As the old saying goes, “if you can make it there, you can make it anywhere.” Bruce learned to overcome the challenges of a small town kid in the big city. He earned success helping manage pensions, including at Bath Iron Works. After marrying his Maine sweetheart, he returned home to Maine. He then had to overcome yet another challenge when he lost his wife while his son was just a toddler. He raised his son Sammy mostly as a single dad. Giving back, he served as Maine’s State Treasurer. He quickly earned a reputation of promoting honesty, integrity and fiscal responsibility. Bruce stopped the practice of Maine officials going on lavish trips to be wooed by Wall Street. 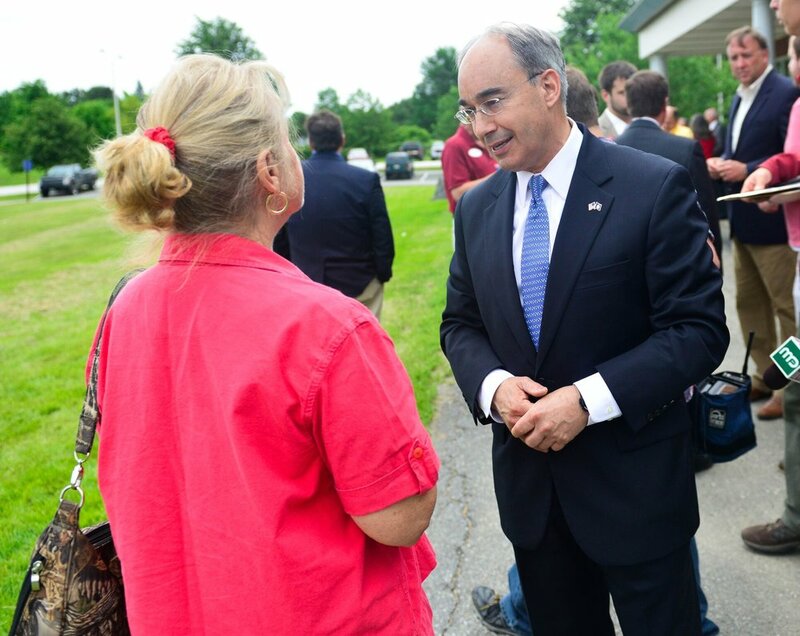 Under Treasurer Poliquin, companies were forced to bid for Maine’s bond work resulting in thousands of dollars in savings. He was the leading voice in ending wasteful spending at the Maine State Housing Authority which lowered costs and allowed more Maine families to receive shelter. He helped eliminate 1.7 billion dollars of public pension debt. With the savings he advocated, Bruce helped usher in the largest income tax cut in Maine history. Serving as Maine’s 2nd District Congressman, Bruce has become a leading national voice for solving problems rather than just playing political games. In his first term in Congress he was able to pass legislative language into law and get multiple bipartisan bills passed through the United State House of Representatives – proving you can stand on principle, but also work across the aisle to get things done. Bruce continues to achieve success by getting Legislation to help Maine job creation passed by the House on wide, bipartisan margins despite the acrimony in Washington. He has supported efforts to balance the budget, lower taxes, and reduce red tape. Bruce is a Member of the Congressional Sportsmen’s Caucus, the Bipartisan Task Force to Combat the Heroin Epidemic, and has been an active member of the Women in the 21st Century Workforce working group.